Item shown above : Mahogany Finish, with Blue Felt bottom. Flag and insignia NOT INCLUDED. Display your accomplishments with pride. This is a super fine Flag & Medals/Pins/Ribbons Display Case that you will never need to apologize for. Repeatedly sanded to make the surface as smooth possible. Matted interior made this case very flag-material friendly. 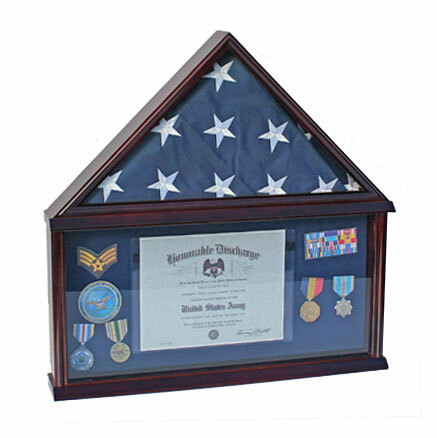 A great way to display your military medals/ribbons, patches and pins collections. Medals, ribbons and pins can be placed directly into the 1/2 inch thick foam back. Would accommodate certificate 8.5" W X 11"H or 11" W X 8.5"H, either way would work. Wall brackets to hang or simply stand it on table top. Glass cover to protect from dust and damage. Simply the best piece to display what you are very proud of for years to come. Can hold 5'x 8'or 5'x 9.5' flag No assembly required.